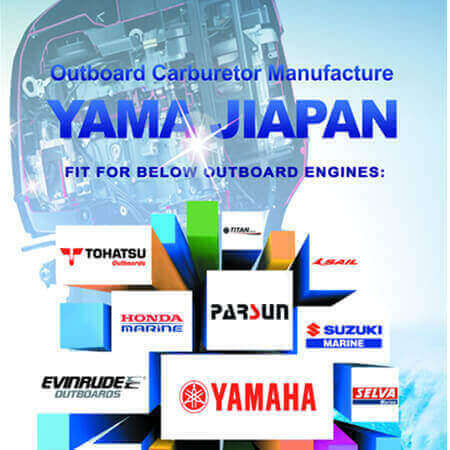 YAMA JIAPAN Carburetor Co.,Ltd. is a big manufacture specializing in Producing, Marketing and R&D of carburetors for Marine Outboard Engine; motorcycles; cars and gasoline engines in China. "We guarantee clients will be satisfied with our products&service"
Hot Selling Gasoline Carburetors fit for Stens Robin Subaru,Honda,Water Pump Dual Fuel Generator,Briggs & Stratton,Walbro, ZAMA,YAMAHA,Genuine Kohler Engine,Cummins,more….. Manufacture Chainsaw Carburetors fit for STIHL Tillotson Poulan Trimmer Brush Cutter Carb fit for Honda ZAMA Walbro HUSQVARNA Carburetors made in China factory supply Cheaper…. Produce Marine outboard Water Pump Impeller Repair Kit fit for Johnson Evinrude Mercury Honda Outboard Suzuki Outboard YAMAHA OUTBOARD Mariner Mercury Force Outboard ….. Need a Reliable Outboard Parts Manufacture you can count on? Look no further! With 20 years’persistent endeavor of our people, YAMA JIAPAN has established a whole set of management system and has passed ISO9001:2008 International Quality Management System , also has got SGS factory inspection report from many famous Enterprises.